Tom Hart is the creator of the Hutch Owen series of graphic novels and books, and has been a core instructor at New York City’s School of Visual Arts for 10 years, teaching cartooning to undergraduates, working adults and teens alike. 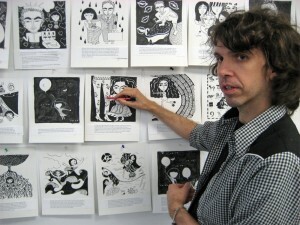 Among his students were Dash Shaw, Sarah Glidden Box Brown and other published cartoonists like Leslie Stein, Jessica Fink, Josh Bayer, Brendan Leach and many others. His own work has been nominated for all the major industry awards; his The Collected Hutch Owen was nominated for best graphic novel in 2000. He was an early recipient of a Xeric Grant for self-publishing cartoonists, and has been on many best-of lists in the Comics Journal and other comix publications. He has been called “One of the great underrated cartoonists of our time” by Eddie Campbell and “One of my favorite cartoonists of the decade” by Scott McCloud. His daily Hutch Owen comic strip ran for 2 years in newspapers in New York and Boston, and his “Ali’s House”, co-created with Margo Dabaie was picked up by King Features Syndicate. He has taught comix and sequential art at schools and institutions all around New York City for 10 years, and has conducted week-long workshops from Maine to Hawaii. Currently Tom operates SAW — the Sequential Artists Workshop in Gainesville, Florida and is at work on his graphic novel Rosalie Lightning and refining his guide to comix and creativity How To Say Everything.